Hello--It's NaBloPoMo number #1103 here, AKA: ChiIL Mama. I'm still on a quest to find as many worthy reasons to get outta laundry and dishes duty as possible! Blog much? Are there chirping crickets in your corner of the blogosphere? Get in the soup. 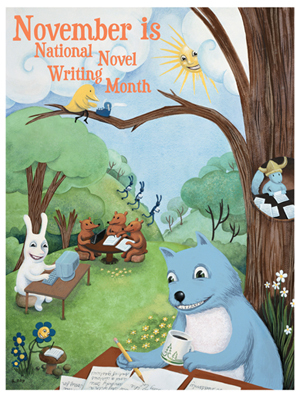 November's a great month to jump start your writing and make it a habit to write a least something daily. After a little bit of waffling, I'm in. 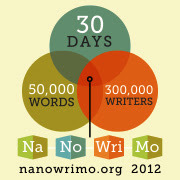 I've done NaNoWriMo --National Novel Writers month, in November for 4 years and managed to successfully write a 50,000+ novel from start to finish during the 30 days of November!!! That said, it's crazy HARD to do with a family, freelance career and loads of blog work. This year I'm still toying with the idea of doing it again, but my blogging has become a full time job and 50,000 word in 30 days is a crazy lotta writing. 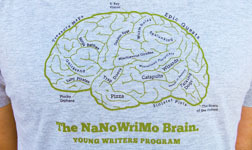 My 9 & 11 year old kids are still teaming up to do the youth version of NaNoWriMo--Young Writers Program again this year. This will be Sagezilla's 3rd year and Du-Jay's 4th. It's not too late to catch that train. If you or your kids are up for a creative, crazy fun challenge this month, check it out here. They don't have to climb that 50,000 word mountain to win. There's an age appropriate word count guide range right on the site. As a mom, I LOVE to see my kids excited about writing and the stories they've collaborated on have been hilarious and super creative. 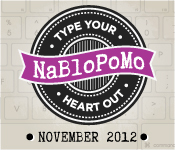 Sooooo, for now I'm going for BlogHer's NaBloPoMo, so I don't have to quit cold turkey. I pretty muchly blog daily as it is, between my main blogs at ChiIL Mama and ChiIL Live Shows and my other two at Dugsound.com and ChiIL Travel Kids. I'll commit to post every day at ChiIL Mama. So check in like we vote in Chi, IL...early and often. Soups on!! Tell us your favourite quotation and why. I have a ton of favorite quotations from theatre greats, women, feminists, and humor writers. Still, here's my fav if I had to pick just one. "Prevent perfection, prefer a perceptive perspective." I hope it doesn't sound too arrogant that it's one I wrote, but it sums up my parenting and life philosophy, it's catchy, and really sinks in the more you think about it. So much stress, anger and craziness result from people trying to be perfect, expecting perfection from others, and beating themselves up for falling short. Human beings are messy, complex, creative beings who learn more from our mistakes than our successes. If you live life from a perceptive perspective, considering intent along with action, factoring in compassion, and using your mind, heart and intuition versus rigid rules set in stone, you'll be healthier and happier. Chicago is my kind of town, without a shadow of a doubt. What are your thoughts about tomorrow's election in the United States? Frankly, I'm a bit freaked out at the racist, misogynistic, backward, hateful, right wing talk that seems to be completely socially acceptable. I always expect more intelligence and compassion from Americans and am surprised and disappointed at the selfishness and hypocrisy. This has been the nastiest presidential race I can remember, with the candidates radically different on so many levels.